The selective processing of inorganic structures with features on the nanometer scale has seen a great surge in interest over the last few decades. These materials are known to possess interesting and useful optical, electronic and/or magnetic properties that can subsequently be exploited in a wide variety of applications ranging from novel forms of catalysis to solar energy conversion. The choice of application is contingent on not only the chemical composition of the material but also on the overall morphology, and even more precisely on the accessible surface area. Currently, there are a myriad of methods available for fabrication of such intricate inorganic structures. However, irrespective of employing a certain fabrication method, the formation of a well-organized architecture is not trivial as various parameters have to be regulated: These include uniformity of size, stabilization against collapse, consistency in the chemical composition and growth of the overall structures with preferred morphology (thin films, spheres, fibers, helical spirals etc.). Towards the aim of employing a synthetic approach to formation of functional materials, inevitably researchers working the area of materials science tend to resort to commercially available reactive precursors for their synthesis. These are habitually alkoxide precursors as they afford simple, innocuous by-products and the reagents are relatively easy to handle for either sol-gel synthesis for viable powders or spin-casting for thin film production. Recently, as part of the Nanoscience and Catalysis group, we have developed a generic, facile route to forming reactive precursors of a variety of elements such as titanium, zinc, bismuth, iron, vanadium and zirconium, all of which contain a simple polyol ligand. These complexes are facile in their formation and their structures have now been elucidated and can function as sophisticated precursors for generation of functional ferroelectrics, multiferroics, semiconductors and catalysts. 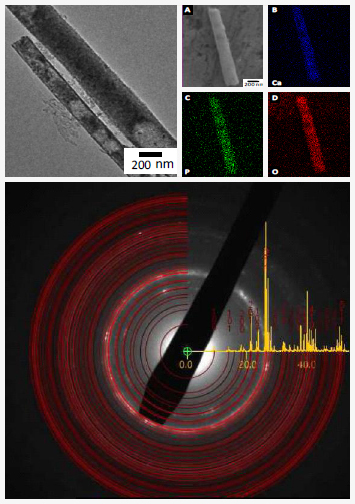 The figure shows single phase, stoichiometrically pure, hollow nanotubes of hydroxyapatite which have been synthesized (single-particle analysis has been performed to successfully prove the sole formation of Ca10(PO4)6(OH)2 phase). The facile synthesis involves a sol-gel process under neutral conditions in the presence of a sacrifical anodic alumina template. The structures formed are hollow nanotubes that have been characterized by XRD, SEM, TEM, SAED, EELS, EDS and BET measurements. The diameter of the resulting tubes is in the range of 140-350 nm, length is on the order of a few microns and the wall thickness of the tubes was found to be ca. 30 nm. Moreover these tubes had a large BET surface area of 115 m2/g and were found to be biocompatible. They displayed inertness in the presence of NIH 3T3 mouse fibroblast cells as dictated by an MTT assay. More information about our methods and activities in this area can be found here.